The arts and antiques of Japan have been collected in the West ever since the country reopened its doors to trade with foreigners in the 1853. Japanese art spans early wood sculpture dating back to the Momoyama period and prized early porcelain from the Nabeshima or Kakiemon kilns. However many of the collectable categories of Japanese art date from the Meiji period (1868-1912) such as miniatures like netsuke and inro, metalwares, bronze sculptures, armour, swords and sword fittings such as tsuba. For the first time in a decade, Sotheby’s Asian Art in London offering included a designated sale of Japanese art on November 6. November is the UK’s busiest month of Asian art sales with a glut of auctions taking place in both London and the regions. 'La fête d’anniversaire' by the Japanese-French artist Léonard Foujita (1886-1968) sold for a hammer price of £6.1m (plus buyer's premium) to one of eight phone bidders at Bonhams’ Impressionist and Modern Art sale on October 11. The growing momentum behind at least some Japanese works of art – given Sotheby’s seal of approval with the announcement of its first dedicated sale in 11 years (ATG No 2357) – has been noted at a lower level in provincial rooms for some time. Japonisme, western art inspired by Japanese art and design, is the theme of the next Decorative Antiques and Textiles Fair in London’s Battersea. At the event, which runs from October 2-7, a showcase in the foyer focuses on pieces that reflect the influence of Japanese design on European interiors. A series of woodblock prints by the Japanese artist Kuniyoshi (1798-1861) portrays the 47 ronin, a group of ferociously loyal samurai who famously avenged their master’s death. Sotheby’s is to test the temperature of the market for Japanese art with its first dedicated sale in London for more than a decade. 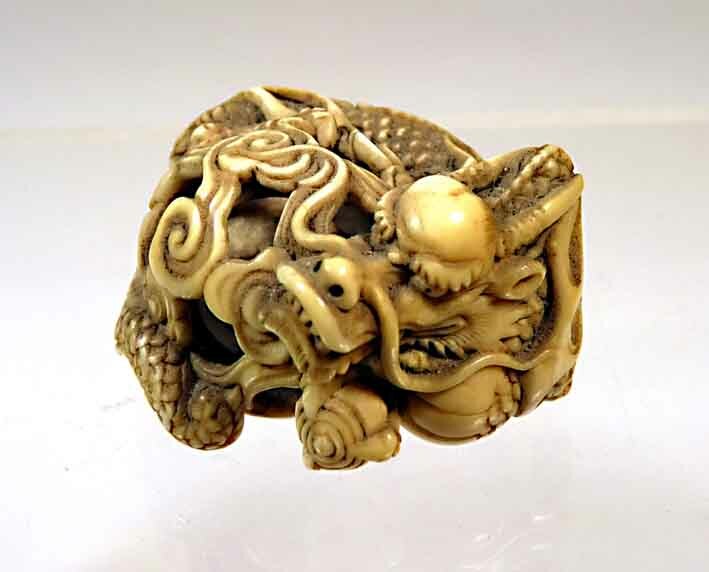 Dealer Rosemary Bandini, who specialises in Japanese netsuke, calls a figure that she sold recently one of her most frustrating yet intriguing discoveries to date. Auction house Christie’s will celebrate the 160th anniversary of diplomatic relations between France and Japan with an auction called Japonisms at Christie’s Paris in November, writes Hannah Stokes. The 195-lot collection of mask netsuke amassed by Swiss entrepreneur Peter Müller met with mixed success when offered by Matthew Barton (24% buyer’s premium).